BURBANK, CA (Oct 28, 2015) – The original 1960s series that set the stage for the major feature film this summer is back with the release of The Man From U.N.C.L.E. : The Complete Second Season. During its second season, The Man From U.N.C.L.E. was recognized as the Golden Globe winner for Best TV Show and nominated for 10 Emmy Awards. 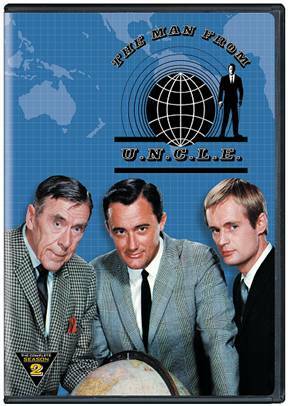 Led by a star studded cast featuring Leo G. Carrol, David McCallum and Robert Vaughn, the twist and turns continue as Warner Bros. Home Entertainment releases The Man From U.N.C.L.E. : The Complete Second Season on DVD February 2, 2016. The 10 disc series includes all 30 one-hour episodes of full-color entertainment. Top agents Napoleon Solo and Illya Kuryakin, played by actors Robert Vaughn and David McCallum, use their charm, wit, and assortment of gadgets to defend the world from their international syndicate T.H.R.U.S.H. The second season continues with all the excitement from season one, as the agents travel all over the world to take on T.H.R.U.S.H and its axis of evil Allies. Whether the agents are posing as prison inspectors or obtaining mind-reading devices, the adventures are sure to continue throughout the season. This exciting season also features guest appearances by Jill Ireland, Angela Lansbury, Kevin McCarthy, Vincent Price and George Sanders. Posted in News, Press Releases, Warner Bros.Tagged The Man From U.N.C.L.E. The Bible Continues AVAILABLE ON DVD TODAY!